Evelyn Chrystalla Pielou in the Meadows above Kelowna and Okanagan Lake in spring. Evelyn Chrystalla "E.C." Pielou (February 20, 1924 – July 16, 2016) was a Canadian statistical ecologist. She began her career as a researcher for the Canadian Department of Forestry (1963–64) and the Canadian Department of Agriculture (1964–67). Later she was professor of biology at Queen's University, Kingston, Ontario (1968–71) and at Dalhousie University in Halifax, Nova Scotia (1974–81) and then Oil Sands Environmental Research Professor working out of the University of Lethbridge, Alberta (1981–86). Pielou was the second woman to win the Eminent Ecologist Award (1986) from the Ecological Society of America. She has contributed significantly to the development of mathematical ecology, the mathematical modeling of natural systems, and wrote six academic books on the subject. 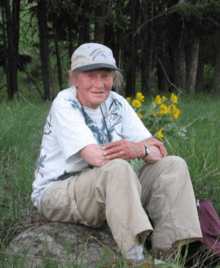 She lived in Comox, British Columbia, Canada, and wrote popular books on natural history until her death in July, 2016. ↑ "Chris Pielou ( Saturday, 16 Jul 2016 )". Campbell River Mirror.